It's the time of year where people are venturing out into their gardens after a long winter. Or in the case of us Floridians, after a long, hot, drought. What better way to celebrate the change in seasons but with compost? Seriously, compost! You know, that mushy mess you've been stirring, trying to turn it into healthy plant food. 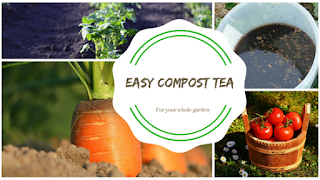 One of the best ways to nourish your garden is by utilizing compost and brewing compost tea. What in the world is compost tea? Compost tea is a liquid fertilizer for your plants. Most gardeners consider it “liquid gold.” It's super rich in nutrients, well-balanced, and organic. By brewing compost tea, you enhance the already amazing effects of your compost by adding oxygen. Compost tea helps to increase plant growth, provides fast-acting and quickly absorbed nutrients, provides beneficial organisms (like bacteria) to help boost your plant's immunity, helps suppress diseases and ward off pests, and goes a long way to replace toxic garden chemicals. The best part about compost tea, however, is that if you compost, you can make it year-round, for free! To start brewing all you really need is well-finished compost (compost that has been broken down into tiny particles. The best place to find this is at the bottom of your compost bin. You don't need much to make a decent batch of compost tea. ), a 10-gallon bucket, and a water source. You can also aerate your compost tea by adding a pump to keep the tea moving around, providing a continual oxygen boost. Also optional is a commercial catalyst that can help jump-start the growth of all the beneficial microbes present in your compost. The first step is to fill your bucket 1/3 of the way full with your compost. Then you add water to the top of the bucket. Now if you're using tap water, make sure that you have let it set out for at least a day to get rid of the chlorine, which can kill all those beneficial microbes you want to grow. After adding your water, let the tea steep for 3-4 days, stirring occasionally. After this time, strain the liquid for use. You can brew this simple tea, or you can boost the nutrient quality of it by adding a sugar source and/or more nutritious substances. The sugar source, like unsulphered molasses, provides food for the microbes. Powdered seaweed, or fish emulsion, are great to help boost the nutrient quality of your tea. You can also let your compost tea sit for up to a week to make it concentrated. You can use compost tea in several ways, the easiest of which is by simply pouring it, undiluted and/or unfiltered, onto the soil around your hardy trees and shrubs. You can also dilute it for use on your more delicate or container-bound plants. 10 parts water to 1 part tea is a good start for diluting. You can also use it as a foliar spray, directly on the leaves of the plant. For this you should dilute the tea and add 1/8 tsp of oil to the mix to help it adhere to the leaves. I hope you enjoy making your compost tea! Feel free to ask questions or comment below! I also enjoy seeing pictures of your amazing gardens!